It all started a couple months ago, when I was working on the synopsis for Strength. I needed to outline each chapter's plot points for a quick reference and decided to use index cards. That's when my obsessive, overly-organized side took over. Needless to say, the whole project snowballed. I ended up including characters and places, too--and you know what? Those obnoxiously bright cards convinced me to formally outline my next MS! (On paper, that is, since it's all subject to change.) But I digress. Buy colorful index cards. C'mon, they're stimulating. You can even color-code, if you want. If you're planning on writing these out by hand, skip to step #5. Create a new document and change the page/card size to 3'' x 5'' (or whatever size index cards you bought). Make the first one a title card. If you're like me, you'll want to use the fronts and backs of the remaining cards. 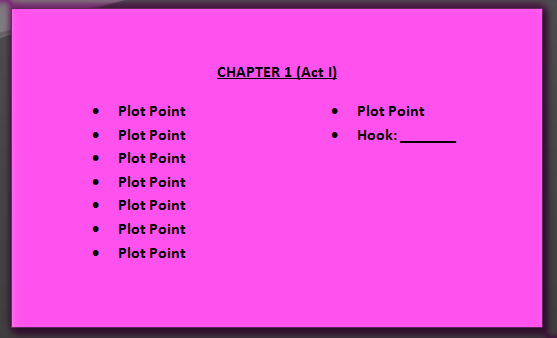 On the front of each card, list the chapter, act (if applicable), significant plot points, and any designated hooks. 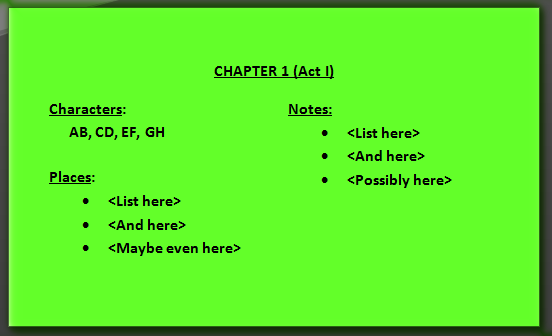 On the back of each card, list the chapter, act (if applicable), characters, places, and any additional notes. Do any of you keep quick reference cards/sheets? If not, how do you keep track of things? I have a word doc that breaks down the events in each chapter. It helps a lot when I need to know where I'm going. I've found I'm planning more and more with each book. I don't use index cards (but might as they're so pretty and bright). I've just being using plain old paper. Pantser! Pantser! Have I ever told you how much I hate that word? Of course I have. Anyway, it looks like a pretty grooving system, and not just because of the colorful cards. I haven't graduated to that, though I find myself doing some outlining when I feel like I need to know where I'm going. I'm about at that stage in my current WiP. Yay for index cards. I like to use them while plotting too, it helps me make sure my scenes all end in conflict and amp up the tension, to make sure each one is necessary and moves the story along. You had me at colorful cards. They look so fun! Love your creative organization method! I'm a planner too. Those do look fun...I've been eyeing Scrivener for a similar reason (the corkboard feature looks potentially awesome.) I'm coming to the conclusion that I may actually be a plotter, because my pantsing tends to end in a lot of nothing or else in too many things all on top of each other. I'm all for super organization! I live by Excel grids! I do wonder about all the software around that's supposed to help you with plotting when I'm all about scribing by hand and keeping it in front of you. Carrie, what a great idea. I've been a pantster for the most part so far, but I'm also starting to feel the need to plot and outline more and more, as well as create character sheets. I did a project with index cards for NaNo a couple of years ago. I used the sticky note 3x5 cards though, so I could put them on my huge white board and move them around as necessary. I'm kinda visual. I find that plotting and pantsing aren't two mutually exclusive options. It's a spectrum with "obsessive planning and outlining" on one end and "never gave it a thought before I sat down to write" at the other. I think I fall somewhere in the middle. I can't write unless I have a pretty good idea of my starting and ending points at least and some of the stops I want to make a long the way. But everything is subject to change while I'm writing and often does. I don't use cards but I do write all the details down in a notebook. Nooooo! You've left us pantsers behind! I also don't like wearing pants, but whatever. Whoa, girl you're a mad woman with all those cards! lol tehe I just make a standard 2 page synopsis first then break it down into a Microsoft excel scene list. I follow that until it's done. Your process seems fun though. It's always good to try something different and I hope with your new process for your next MS it works for you! Oh man. 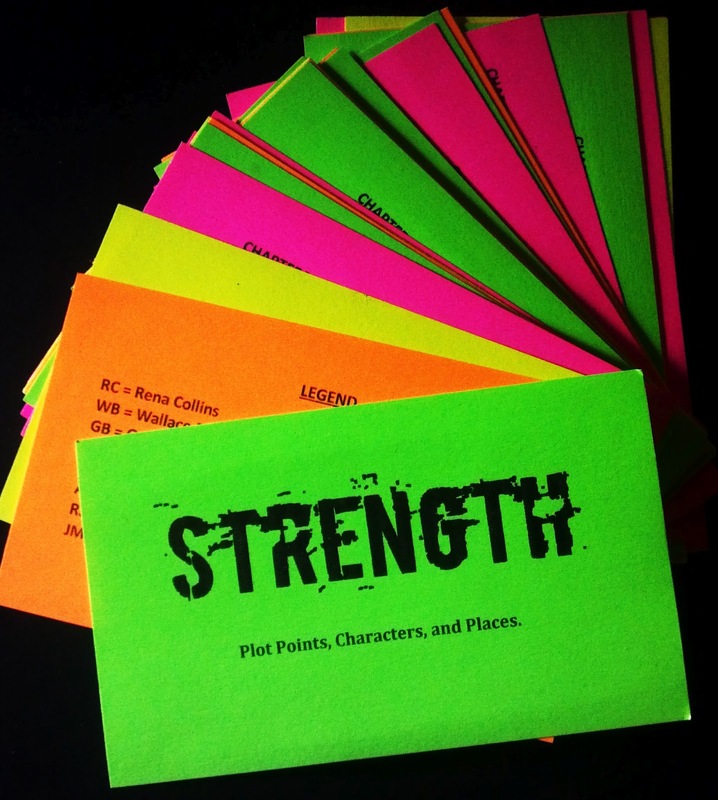 When I was writing Strength, I had outline-style notes everywhere. Word documents, Excel spreadsheets, Post-it notes, napkins, torn off pieces of bills, written on my arm, etc. Nothing was in order, and I was constantly pulling at my hair. LOL I'm just glad to be trying a new system. I tend to stay inbetween, too. Old habits die hard. ;) Oo, I never thought about keeping track of words characters use. Great idea! Me too. I think it's because our brains can only hold so much detail. :) Nothing wrong with plain ol' paper! Thanks, Juliana! :) I think I'm a mix, too. I try to be vague with my plot points, so I can still work through the feelings/surprises of each chapter. Hey, whatever works. :) Thank you! I LOVE index cards for planning, but I've never organized my scene cards in the way you have shown -- maybe I'll have to try it because I'm pretty good about quick character cards (for those little details that somehow always come up but never seem majorly important) and setting cards, but I always feel like my plot cards become overwhelmed. This was the perfect reminder I need to keep it organized (the legend idea is brilliant!) and keep it semi-simple. I am a planner, so my index cards are my "quick and dirty" version, usually, of a fuller outline that exists elsewhere. Index cards are so easy to carry! Oh, and I am totally color coding. & thank you for making templates, I think that's stellar, too! I have fallen in love with your cards, really I have. Just check all over the web, twitter, facebook, google plus-I am talking them up everywhere. I am a former pantster turned plotter thanks to Martha Alderson & Larry Brooks (which reminds me of something about my get fired up blogfest, but I will email you about that). I have been using cards to plot my scenes, but what we have here is the difference between someone who is incredibly organized and structured (you) and someone who is a cluttered mess (me). Seriously Carrie, these are awesome. Thanks for sharing. I have already downloaded the templates you shared. I've thought about using index cards for writing, but I usually organize by typing outlines into OneNote or Word. And then there's the smattering of papers with random bits of inspiration written on them that I have in a box. You're very good at writing "hooks," Carrie! I had to read this post more after reading the first line. I'm not sure I have a system for keeping my ideas organized. I do have notebooks: 1) technical data/business 2) books that inspire me with my comments about them, and 3) another one for my writing ideas and phrases that captivate me. Your organization skills are inspiring. I use a software program that I stumbled upon last year. It helps me a bit with plotting, mostly with characters and breaking my scenes out (writing them better etc...) I like your system too. I'll have to see if I can adapt some of what your doing in the program Thx. For my current WIP, I have my Really Short Outline (half a page), my Short Outline (one page), my Long Outline (maybe half a page or one page for each chapter), and my Emotional Outline, which I'm still experimenting with. One colour card per POV. I have 3 major POVs in Dead Witness, with 2 minor. I expanded for book #3, but now I'm being lazy on book #6 and I'm just writing. Hah! I love that expression. Thanks, Melodie! ...That's it. I'm adding to my card stack! :D Thanks for sharing, Joylene! I need to get organized! This is actually a great idea. It sure would help me keep my notes in order. I'm a disaster right now! LOL.